New Colorful Sewing Machine Cases! Amazing Black Friday sewing deals, all week long! Whether you're a diehard quilter or fashion wear enthusiast, your sewing machine needs a high quality ride to get from point A to B. 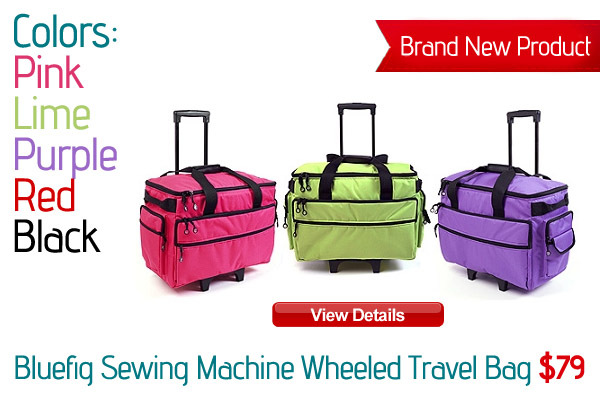 This steel-framed carrier has outer and inner pockets, is fully collapsible, and comes in fun, bright colors for the Sewist with personality! We know how important it is to keep your sewing machine well-protected. That's why this wheeled carrier is constructed from the highest grade 600d polyester fabric. This carrier is holds most small the mid-size machines and has plenty or space for storing all your sewing goodies! Ball Bearing Wheel Set: Ever had luggage wheels jam or wobble annoyingly? Not with this carrier! Ball bearing wheels are sturdy and provide a smooth, bump-free ride for your sewing machine! Steel Frame: This carrier is constructed around a durable steel frame, so no matter how many time you need to shove it in the back of a car, your sewing machine is fully protected. Top/Front Loading: This carrier is built for add-ons! If one carrier isn't enough, you can easily stack and attach more to hold all of your sewing accessories. Fully Collapsible: With all your sewing goodies, extra space can be hard to come by. This carrier is fully collapsible for easy storage when not in use . Although, with colors like Pink, Purple, Black, Red, and Lime - you may not want to tuck this fashion statement away! Accessory Pockets: If your sewing box is over-flowing with thread and notions, no problem! This carrier has enough pockets to store everything you'll need to sew away from home. Don't struggle with "what do I bring"? Bring it all! Copyright © 2012 Sewing Parts Online, All rights reserved.